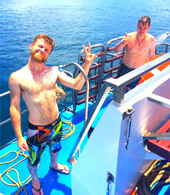 On the route to PP Island - Bamboo Island Overnight Package. 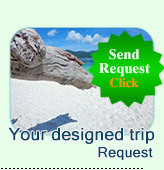 PP Island + Bamboo Island Trip can be done by Speed Boat only in the part. 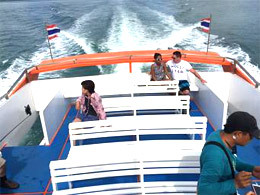 The problem of speed boat is not very good for Old People, Pregnant Woman, Handicapped People, Not strong people or infants. Jc. 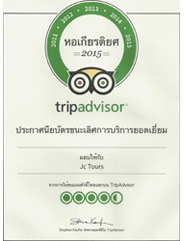 Tour Phuket tried very hard to invest and set up the trip for everyone to visit PP and Bamboo Island. 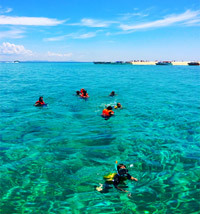 Get more longer "Snorkeling" at Bamboo Island. Because of our "Progressing Boat" can float and keep still on the water make everyone feel great to stay on the boat or jump into the water for snorkeling. 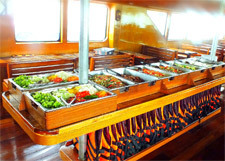 The finest Thai Classic buffet lunch is provided and served on the boat as the Progressing Boat is cruising from Bamboo Island to Maya Bay. It will be a great moment of having lunch surrounding the Andaman Sea view. PP Town, small city with many Tourist, enjoy walking, talking with the new thing whick you never do. This is the hilight of this program. 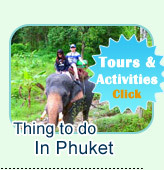 07:30 AM: Pick up from every hotel on Phuket Island by Minibus. 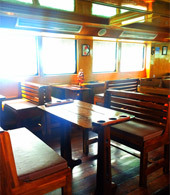 08:45 AM: The progressive leave from the Pier: We serve coffee, tee and soft drinks on the boat. 10:15 AM: We arrival the first stop -Bamboo Island (or Lohmudee Bay). Relaxing, Discovering, Swimming and Snorkeling in clear water. Rolling on the white sandy beach on Yung Island which the coral reef and marine life is the mose completed. For anyone who need to land on Bamboo Island, we service by the longtail boat from Yung Island to Bamboo Island (Just 5 minutes). Or if you like, you can swim to Bamboo Island yourself. 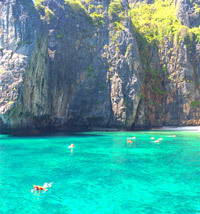 11:30 AM: Cruise to Movie Film Beach, "Maya Bay. 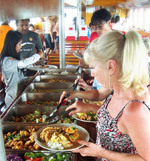 "(Sightseeing) On the way, we serve buffet Lunch. 13:00 PM: We floating the boat in front of the beach. 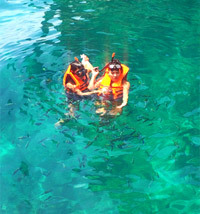 The snorkeling and swimming can start from the boat to the beach. 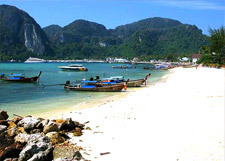 14:00 PM: We cruise as sightseeing to PP Leh Island, Loh Samah Bay, Pileh Cove and Vinking Cave. Use your free time relaxing on the beach of PP Island. Free time and Nightlife on PP Island. We depart from PP Don Island directly to Phuket. 17:00 PM: The progressing arrive the Pier, our minibus take you back to the hotel. Remark: This Program is subject to change according to the weather and sea conditions. Operate Date on July: every Sunday, Monday, Wednesday, Friday.